The day after I waited and waited and waited to see Star Wars Identities I saw the Barbican's sci fi extravaganza Into the Unknown; A Journey through Science Fiction. There was less waiting. The Barbican is much nicer. And the show was one of the best I have ever seen. Into is a history of our imagined future. 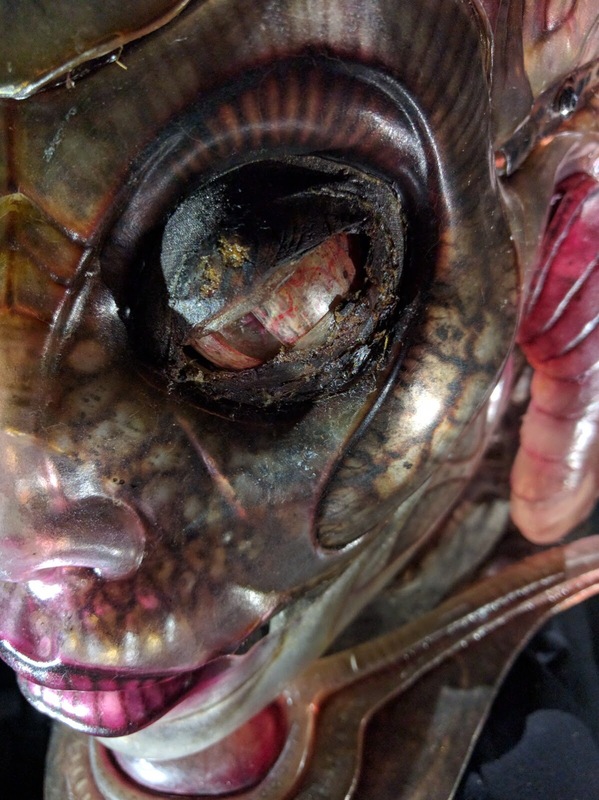 It begins with early examples of science fiction with exhibits from as far back as the 17th century, then moves on to explore the genre through themes rather than a straight chronology. Thus 1930s comics rub shoulders with modern concept art and Bladerunner stills sit alongside edits of the 70s Wonder Woman TV show. I sometimes find that organising things in such a way can lead to bafflement on my part and an inability to grasp the bigger picture, but not so here. And I didn't have to work to ignore an 'experience' the likes of which Identities forces down your throat. One of my favourite production designers, Patrick Tatopaolos, had lent a good deal of his work to the show. 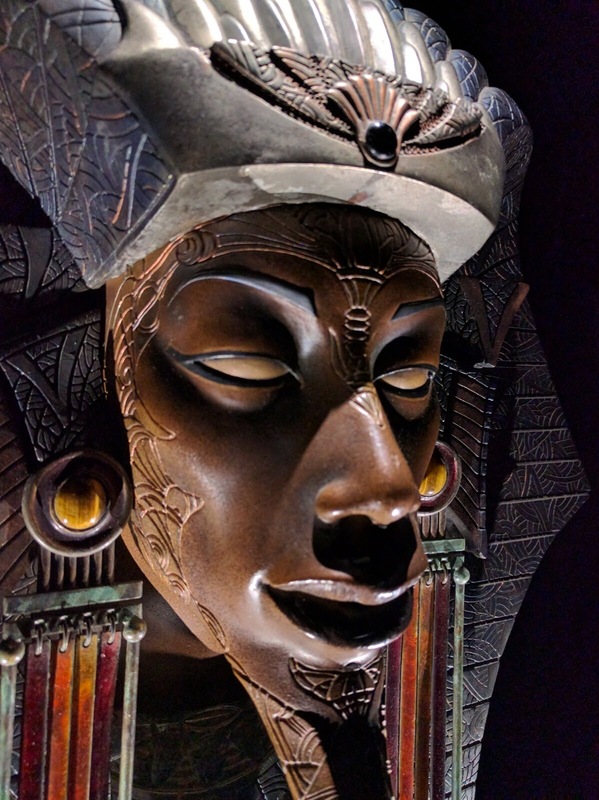 I've blogged before about my love of the original Stargate movie design and OH MY GOD they had all three masks there. Their detail was stunning and I had no idea that even the fabric hanging doo-dahs were superbly made and delicately weathered. I took loads of photos of them and got odd looks as I pressed my face to the glass for ages. This chap needs no introduction. I am pretty sure he is one of the stunt heads from Aliens (and not a 'hero' head). I had read before how the paint scheme on these was deliberately high-contrast so it had a chance of registering on camera under the low-lights. This prop seems to confirm that fact. I still prefer the clear-domed first movie version though. There was also the painting of the road to the Harkonnen palace and the Harkonnen chair from the Giger estate on show. Que second nerdgasm. Just to be clear - this guy was up high, not lying down. 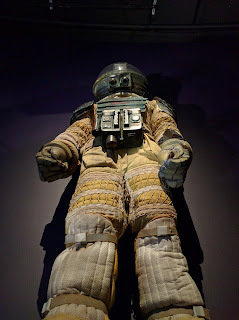 This is Kane's space suit from Alien and what a piece! The fabric work is insane and testament to Ridley Scott's attention to detail. It put the rather dull suit from Interstellar, also on show, to shame. It was a crap movie, but in the 90s Species was the only way geeks could see new work by Giger on screen. I think this might have been a piece from one of the sequels. 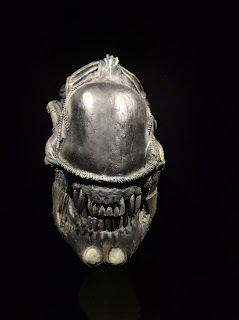 The most interesting thing about Sil is that she represents what Giger originally intended for the finish of the skin of the Big Guy in Alien. The 70s production methods couldn't handle his desire for translucent skin, and it eventually took a rubbish and mildly pornographic franchise to make this a reality. I wet myself again when I saw these. 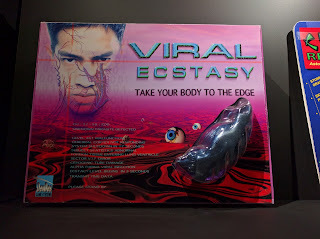 They are props of trippy-VR games from David Cronenberg's eXistenZ. They deliberately channel the (awful) design of tech packaging I remember from the 90s. A rare example of the curators really dropping the ball on lighting. 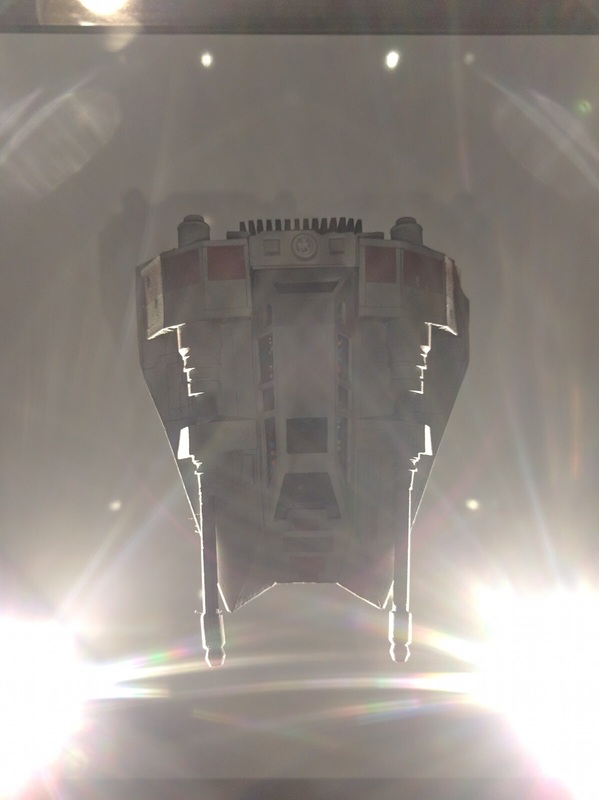 This is an actual Speeder from Empire Strikes Back (probably about 1:50 scale, no not large). It was almost impossible to see, being underlit in a dark room. The final room was devoted to evolution, the nature of humanity and robotics. 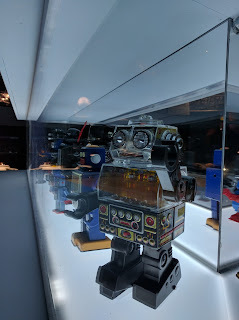 Twiki from Buck Rogers stood alongside robots from AI, but it was a cute array of Japanese tin toys which caught my attention. It was clear that the curators have a great love and knowledge of sci fi. I was really impressed with the breadth of the exhibits and the obscurity of some (like the eXistenZ props). The tour is finished by two conceptual pieces - a film and a kinetic sculpture which are quite at odds with the body of the show. You can take them or (as I quickly did) leave them. 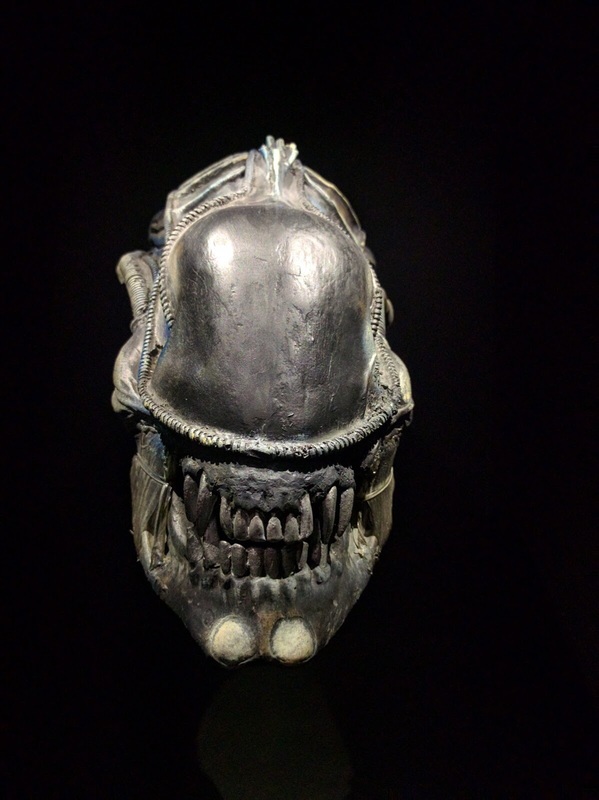 Don't let this put you off though - this is one of the best curations of sci fi artifacts you're going to see in a long time. If you can combine it with Identities you're on for a double win! Damn! One of the few times I really wished I was living in London. It looks like an awesome exhibition. Something I would have loved to take my Dad to. Kane's space suit! That looks even better than the Star Wars one. I'll have to go and have a look. The glass and mirror makes the tin robot toys look like the product of the future! I remember graphics cards coming in boxes like the one from Existenz. I ought to watch that again: it was weird and kind of gross, IIRC, like looking at an Xbox designed by Tyranids. They actually had a 'pod' there too, complete with umbilical cord! Nasty little thing.